Hi, I'm Scott and I am a Wedding Photographer in Somerset with a documentary approach to capturing weddings. I strongly believe that the best wedding photography should not be staged or posed, which is why I focus on capturing genuine emotion and natural moments throughout the day. Documentary Wedding Photography is about the people, the relationships, and the connections. No interrupting, staging, posing or otherwise making you feel uncomfortable during your wedding. I photograph real moments, the actual experiences of the day rather than what I think the day should look like. I’ll certainly get some beautiful shots of the two of you, and I may take the dress out of the closet for a picture, but I generally shoot things how they are and where they are. I do this using available light, capturing candid, natural moments without staging or interrupting. The type of wedding photography you see here is often referred to as reportage wedding photography or wedding photojournalism - whatever you call it, it's about capturing wedding photos that tell the story of your day. Although I’ve worked at all the top wedding wedding venues in Somerset and Bristol like Maunsel House, Walton Castle, and St Audries Park, I think that the best wedding photography comes from the people and the connections on the day, not just the setting. In fact, some of my absolute favourite wedding photography in Somerset took place at an old barn in the rain! When it comes to photographing your wedding, I focus as much on the guests as I do the Bride and Groom. I know from my own wedding how fast the day goes by and there are so many moments throughout the day that you may miss. This way, when you look back at your wedding photos, you’ll be able to relive all the moments you may have missed. Have a look at my gallery of documentary wedding photography here and read more about my approach to photographing weddings. If you’d like more information or would like to check my availability, please get in touch, I’ll send you my wedding photography brochure or we can meet up to discuss your plans and make sure we're the right fit. 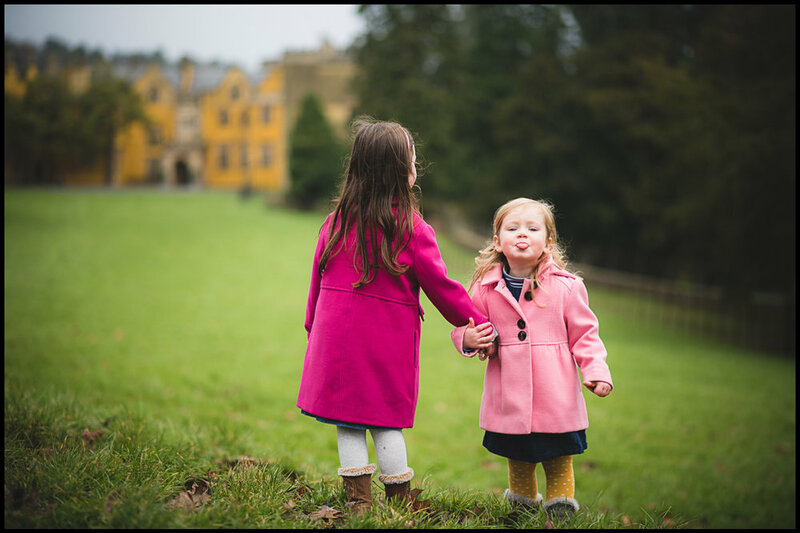 These two little munchkins were dressed to impress for this winter family photo session in Bristol! I've been the wedding photographer at the Great Tythe Barn a few times now and it, once again, provided a great backdrop for this Autumn wedding last year. Autumn, one of my favourite times of the year and a great season for an outdoor family photoshoot. Even though the leaves were mainly down and it wasn't a particularly nice day, these two brothers were troopers and didn't mind getting in the dirt for a play. Such a great day for Autumn wedding photography at one of the best wedding venues in Somerset, Walton Castle. Have a look at my Family Photography Bristol page for more information on Family Photography Sessions in Bristol and Somerset. My family photo sessions follow the same principles as my wedding photography - natural, fun, outdoor sessions where kids and adults are free to play. If you’re looking for stale, white background photography studio photos, you’ve come to the wrong place. Our Instagram Feed, For All The Latest.